A muscular, fit body, with pumped up pecs and a flat belly is the goal of many fitness newbies. You can gain significant muscle mass though a properly executed weight training program, but it takes a combination of diet and exercise to lose the fat. You cannot localize fat loss, no matter how many sit-ups you do. However, once your muscle-to-fat ratio reaches a healthy level, there will likely be no excess fat deposits anywhere on your body -- including your belly. In addition to weight training, you should perform aerobic exercise three to four times a week. Do weight-training exercises three days per week. Perform eight to 10 different exercises divided into two to three sets of each exercise with five to 12 repetitions per set. Focus on exercises that train all of the major muscle groups: upper body -- trapezius, deltoids, brachioradialis and forearms; and lower body -- hip extensors, quadriceps, and calves. Doing squats, bench presses, dead lifts and biceps curls gives all these muscles a workout. Do aerobic exercises 30 to 60 minutes per session, three to seven days a week, advises the Cleveland Clinic. Choose an activity you enjoy, so you will persist. 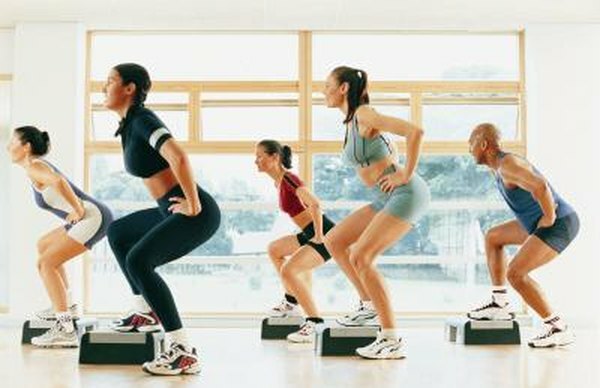 It takes 3,500 calories to lose a pound of fat, and aerobics burns several hundred calories per hour, depending on the activity and the intensity. Performing low-intensity aerobics shortly following a weight training workout will maximize weight loss. Replace high-calorie, high-fat and sugar-laden foods in your diet with more fresh fruits and vegetables and lean protein. Low-fat protein is particularly important for building muscle. Go easy on the salt and eliminate alcohol from your diet. Reform your eating schedule. Instead of three large meals a day, eat six large meals. Make breakfast your largest meal of the day. Eat a protein-rich meal immediately after any weight training workout, advises CNN diet and fitness expert Dr. Melina Jampolis, and increase your protein intake to at least 2.5 grams per day per pound of body weight. Weight training increases your basal metabolic rate, causing your body to burn more calories 24 hours a day to maintain your weight loss. Consult with your doctor before beginning an exercise program.